AVE in Ronda? Don’t Bet On It! For several years we in Ronda have been speculating about the eventual arrival of the AVE, Spain’s version of a high speed train capable of flitting between cities at 350km per hour. Local government and the Junta de Andalucía have promised the rail from Algeciras to Antequera, with a convenient stop in Ronda would be completed by 2013. A new report throws considerable doubt on the idea, in fact Ronda may not see the AVE at all. 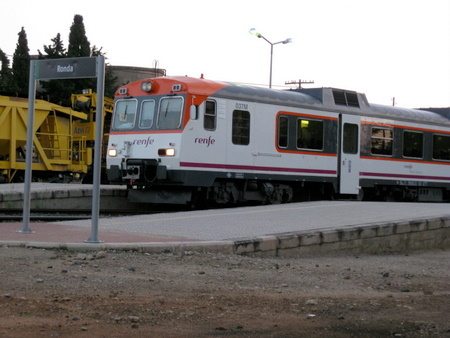 Despite a 176 million Euro upgrade of the line from Ronda to Algeciras in preparation of the electrification of the line, no date has been set on when Ronda would be connected by AVE, and final approval of the line has not been approved, with three competing routes near Ronda still under investigation. 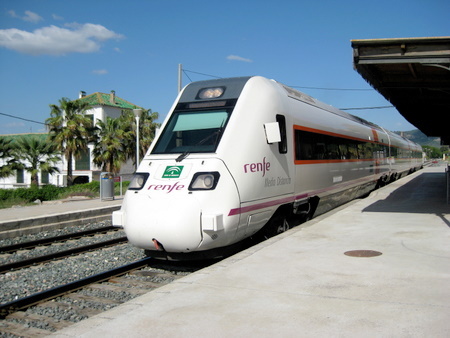 However, Ronda Today has learned that in fact the Plan de Infraestructuras para la Sostenibilidad del Transporte de Andalucía (PISTA) excludes the AVE from Ronda, and instead the city of the Tajo is more likely to receive the altas prestaciones (high performance) trains which have a maximum speed of 250kmh, and do not require the exacting standards of high speed line that the AVE does. Prelimanary plans to connect Málaga and the Costa del Sol are considered more advanced than AVE plans for Antequera-Ronda-Algeciras, though preliminary plans are just the first of many approval stages and this does not necessarily mean that the projected Marbella AVE will actually get the go ahead given that new track would need to be built. Furthermore, plans are underway to connect Algeciras by AVE to Cadíz, and from there to Sevilla, Córdoba, and Madrid, thus bypassing Ronda altogether. The Sevilla-Cadíz AVE line is under construction, projected to be complete by 2012, the 200th anniversary of the first Spanish constitution. The provincial government of Cadíz and Ayuntamiento of Algeciras are understood to favour a spur on the Sevilla-Cadíz line, and are campaigning to see the Algeciras-Cadíz line built and operational by 2025 or 2030, whereas the altas prestaciones upgrade for Ronda may not occur until after 2020. Currenty the AVE is under construction throughout Spain, and Ronda’s nearest station is Antequera-Santa Ana which is expected to be the main central Andalucía hub for Málaga and Granada. A new line currently under construction from Barcelona to Murcia will probably also extend to Almería, whilst another line from Sevilla to Huelva has also received a commitment to transit into the Algarve in Portugal. Taken together, the likelihood of Ronda being part of the AVE network any time soon looks increasingly unlikely, and may not happen at all. After 6 months of work which required the closure of the Algeciras-Ronda section of the line, today Antonio González, president of Infrastructure administration in the national rail authority ADIF announced the reopening of the line. Since October 26th, the line has been closed to allow for new track laying including new concrete sleepers, the construction and renovation of 14 tunnels, and preparation for the electrification of the line. Work is ongoing, expected to be complete at the end of 2010, however González confirmed to Ronda Today that the line will reopen to passenger and freight traffic since the remainder of the 176 million Euro project mostly involves renovation work that can be completed when services aren’t running. Passengers who know the route will discover an additional 6 tunnels that previously were open track, but which are necessary for the safe operation of services, as well as several bends that have had camber adjustments allowing for slightly faster services. At present the line continues in the same location as before renovations started, with the future AVE line yet to be decided. Ronda’s mayor Antonio Marín Lara also announced that part of the land owned by ADIF at the Campo del Nene will be converted to car parking space to alleviate problems in Ronda.